Some 50% of these thefts occur on parking areas alongside the highways and national roads; even in spite of the fact that the toll highways have controlled tollgates. 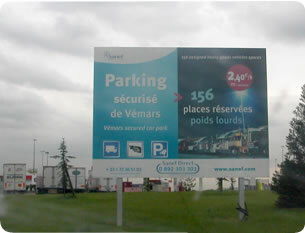 The necessity of public guarded parking areas in FRANCE has been underlined several times by the carriers and their insurers, as they bear important losses. 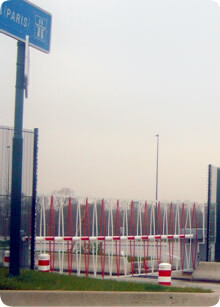 The first one is an initiative of the ASF (Autoroutes du Sud de la France) who opened in November 2004 guarded parkings alongside the A 46 (the Eastern “périphérique” of LYON) at both sides of the highway at COMMUNAY. Facilities include a 2 m high fence, CCTV surveillance, illumination, entrance controll but also facilities for the drivers such as restaurant and sanitary infrastructure. Rates are from approx. € 2 / hour upto approx. €25 /night. 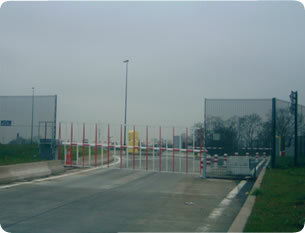 The second one is an initiative of the SANEF who opened in December 2004 a guarded parking area on the A 1 highway LILLE- PARIS at VEMARS OUEST. -	about 1.000 trucks / day stop at Vémars- Ouest. Rates are at approx. € 2 / hour. Facilities are similar as for the first project described above. Both initiatives are still modest in size, but it is an interesting evolution for the future.